Accidents are inevitable and there would not be any surprises, if you accidentally format your hard disk. Many come across the situation when there is formatting or re-formatting of the hard disk or any other storage device, either accidentally or intentionally. As a result, we land up in a catastrophic situation when we lose access to the hard disk partitions and hence the data within. 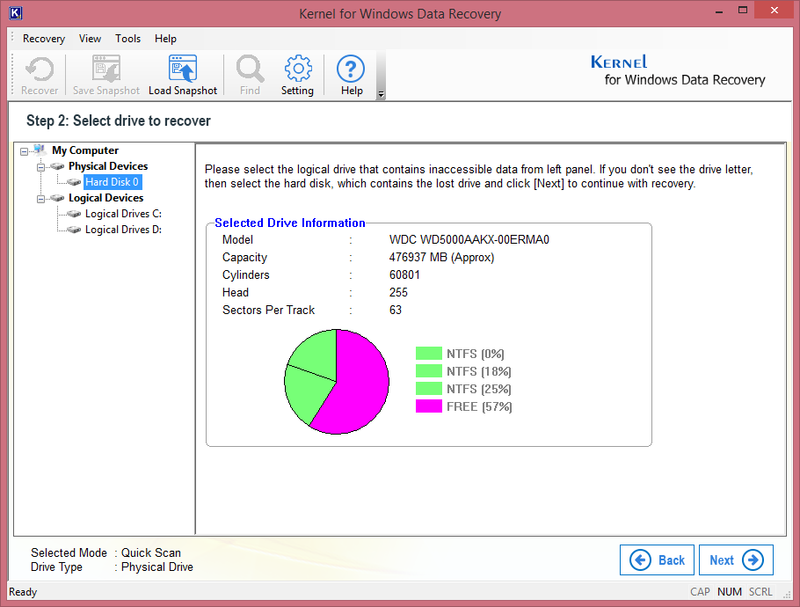 But nothing to worry about, Kernel for Windows data recovery software is here to help you out. Basically, there are two cases of formatting. Case 1: when you have formatted the drive to same file system i.e. from FAT to FAT or from NTFS to NTFS. Case 2: when you have formatted the drive to other file system i.e. from FAT to NTFS or vice-versa. The first case mentioned above is termed as formatting as the drive is formatted to the same file system as earlier. The other one is called re-formatting, where drive is formatted with different file system. In re-formatting, chances of overwriting of data are high and hence, negligible chances of successful data recovery. The software raises the chances of accurate and successful recovery, both in formatted and re-formatted case. 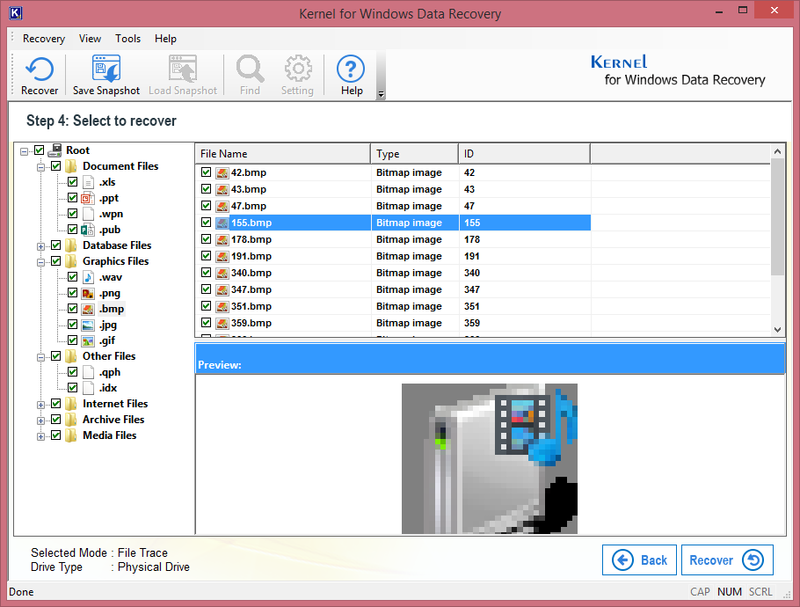 For time effective and result oriented recovery of formatted and re-formatted partition, Kernel Windows data recovery software provides you with two productive recovery modes: Standard Scan and Advance Scan. Standard Scan is the fast mode, recommended in cases of file deletion, partition deletion, damaged partition and bad sectors in partition. Advance Scan mode is a deep and efficient method of recovering data. It is preferred when Standard Scan fails to recover and when partition is formatted, deleted long time back, OS reloads. With the Search Partition option in the software, users can search for the partitions which they had deleted, or missing. 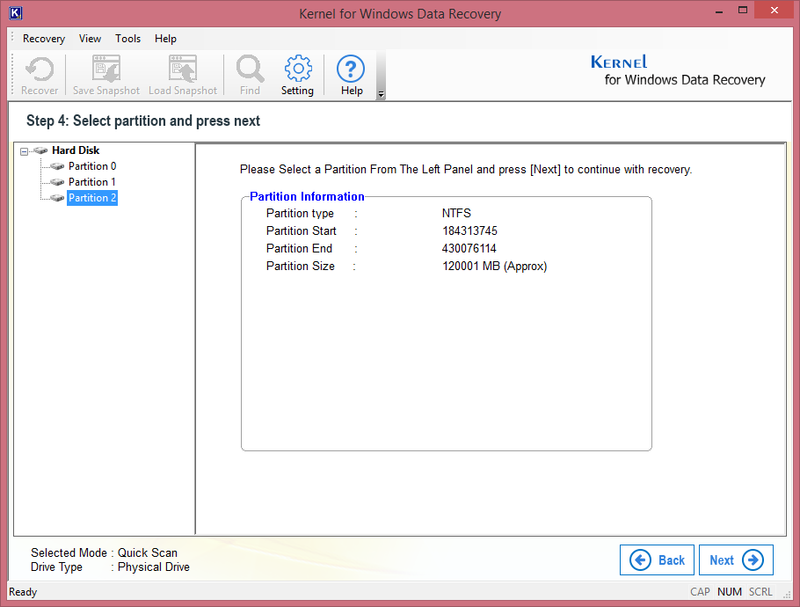 Kernel for Windows Data Recovery software for FAT and NTFS partition recovery will search and locate sectors of the drive and list the found partitions. 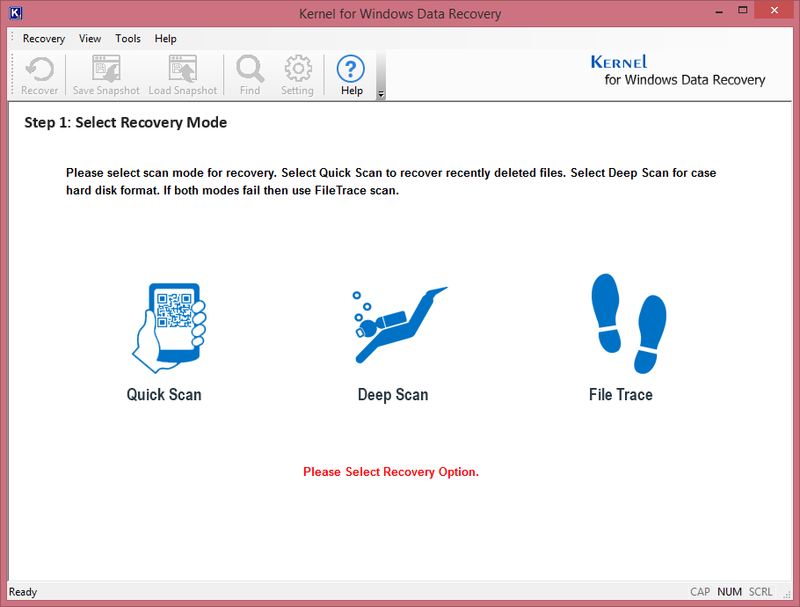 Step 1: Start Kernel for Windows Data Recovery software and select a recovery mode as desired amongst the options – Quick Scan, Deep Scan and File Trace. Step 2: Select a logical drive scanned by the software containing data that got deleted by mistake. Click Next to proceed to the next steps. Step 3: Now select a partition of the selected drive and select the Next button. Step 4: Select the file format you want to recover from the listed formats. The file types appear when you choose File Trace scan mode in Step 1. 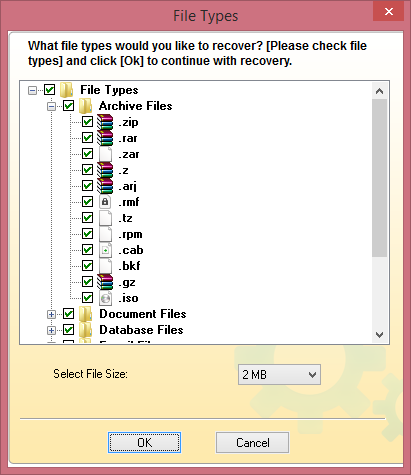 Step 5: Preview recovered files before saving and click Recover button to proceed. 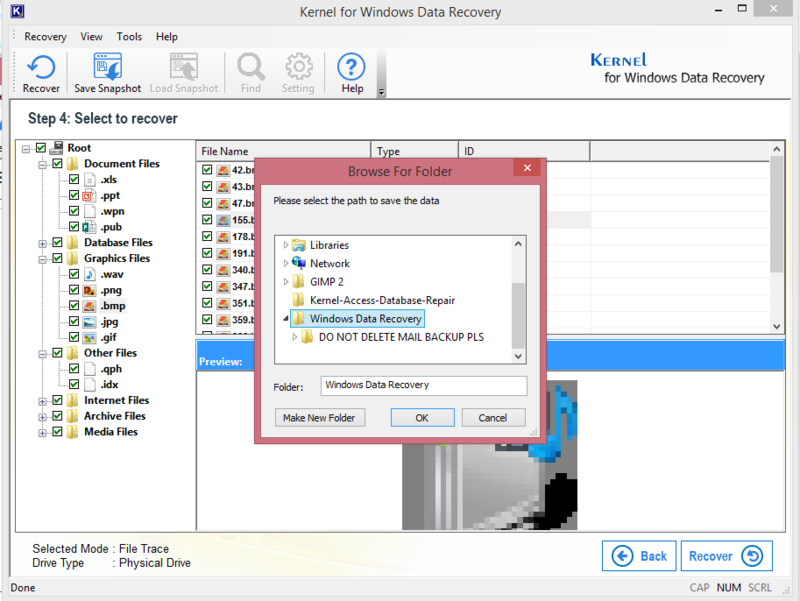 Step 6: Select the path to save the recovered data on your computer. With all these magnificent features, software will recover accidentally formatted partition data from Windows 7, Vista, XP, 2003, 2002, 2000, 98, 95. Its evaluation version is free to download utility for the users to experience features and functions of the software.